This is our son, Tommy’s remodeled room. When we bought the house, the room looked like this below. The ceiling was pitched to the right. We gave it a center pitch and added insulation. Tommy picked out the antique engraving on the far wall when we lived in Paris. and their national soccer team. It shows a French ship beating a British flotilla. Do you think Tommy’s room normally looks like this? Of course, not. He’s an 18 year old. 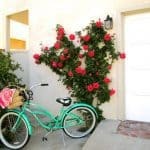 Martha Stewart commented on my first Kitchen Remodel post here ? It said…”Decent article. Keep working on it. Sort of an authentic ring to it, right? 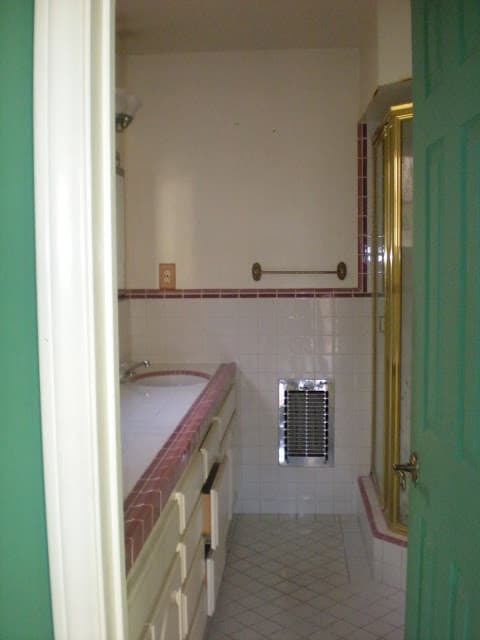 Here is a view into his bathroom. This was featured in an earlier post on all three bath remodels. Look how neat his desk is. and three days later he started the summer session at the University of Florida. (I’m holding the diploma with the bad hair–windy day). It’s nice having his room look like this, but I’d still rather have Tommy in it. We have an empty nest now with our daughter in New York city. But Tommy will be back for a couple weeks in August. Do you miss your children’s messes or are you still “enjoying” them? I love what you did with your son's room! You created a wonderful space perfect for a young man. Great work! What a great-looking room–you did a brilliant job! I am beyond relieved that it doesn't look like that when he's actually living there. Our college son is home all summer, which I love, but his room is a mess. And we're always out of milk. Wow that is just stunning!! LUCKY TOMMY! I am amazed at the transformation with your beauitful before and after. You did a beautiful job and I love that his touches were put into the room (and Tommy has excellent taste might I add) Just gorgeous in every single way….its so hard when they leave the roost, but it sounds like its all good. And those visits back to the beach house will mean that much more when he visits! The transformation of Tommy's room is amazing. He's a lucky guy, and his mom doesn't look old enough to have grown children! I am still ENJOYING (wink) my kids' messes. Tommy is a gem , love the Martha comment! I have three brothers and I owe my sense of humor to them:) great post. Tommy's room looks wonderful! Right now it looks nicer then our master bedroom. You have a lovely home. We are empty nesters now. Raised 4, 3 boys and 1 girl. Three are married and we have 3 grand kids, just wait, you will go crazy then. You can hold them, spoil them and send them home. It's awesome. 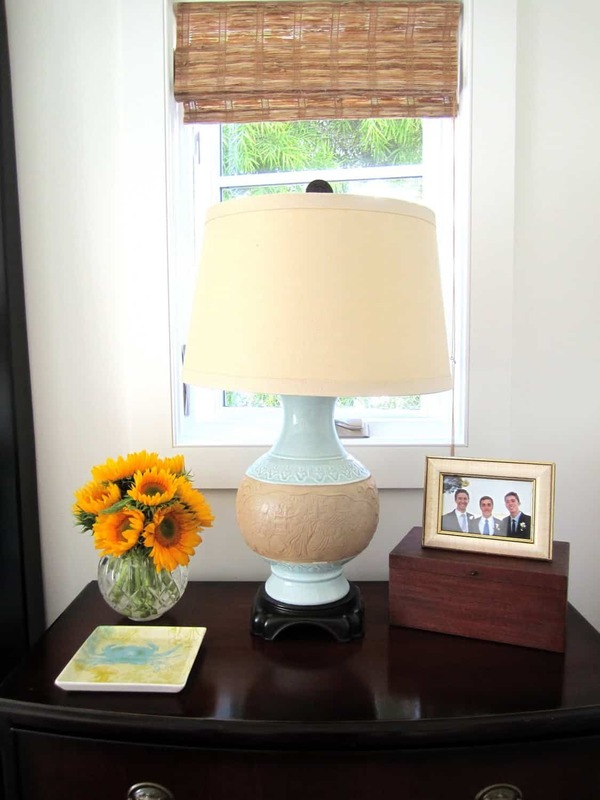 That room is stunning and I love those lamps. My daughter's room was a mess, but my son kept his neat believe it or not. He was kind of OCD in that department. I don't think he is anymore. He even cleaned his sister's room when they were toddlers. Classic room. I'm in the midst of the messes, ages 2 and 1! Love the ship art where are your sources from? Great room! 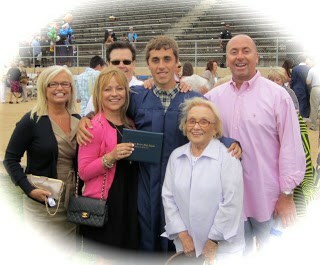 I try and stay aware everyday that they will too quickly be off to college and no more messes. You are so amazing at pulling a room together Mary Ann. I lament the fact that you live all the way across the country from me -please come visit and work your magic in my house! What a great transformation!! And I would be thrilled if my boys' room looked like Tommy's on his messy day!! I'm afraid we're in a different category of messy. My boys are home for the summer and I must say, if I want to really enjoy having them, I just have to shut the door and my eyes!! Congratulations to your son on his graduation! You are so talented. Love his bedroom and bath! The change is amazing. I prefer neat, but would not if that means the kids are no longer here. This room is gorgeous! 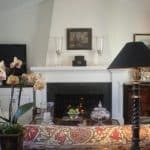 Hi Mary Ann, It is a perfect room! I am sure you miss having Tommy home, he'll be back though, a lot, trust me!! Thank you for joining my Giveaway of a very special painting! * G' beauuuuutiful Sunday mornin', Mary Ann! As I started to write, I noticed the comment, directly above, from "SHERRY HART"… She basically took the words right off my keyboard! 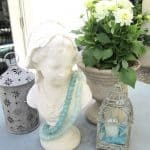 KNOW you will enjoy your Sunday~ I mean, Sunday at home in Newport… how wonnnnderful THAT sounds! Going out for brunch today? My daughter moved out last year and I didn't waste anytime redoing her space. I still see her frequently…and I do not miss her messy bedroom. It's so nice to walk by it and see the bed made and no clothes on the floor! Beautiful job on your son's room/bathroom, what a transformation! What a beautiful room and en suite! I would have never have thought to change the ceiling pitch. Tommy's room looks like a really wonderful master, just beautiful finishes and accessories! We still are in the thick of the messy years, but I know I'll miss it when they're gone. Thanks for sharing. And, yes, I would VERY MUCH rather look at my daughters' and sons' messy rooms than the neat empty nest they have left behind. Cruelly missing them now that they live in Paris and Australia. Wow – what a gorgeous room! And the bathroom looks amazing too! I love all the white with the contrasting darker art and furniture. ha! Tommy cracks me up! That comment from Martha does have an authentic ring to it! 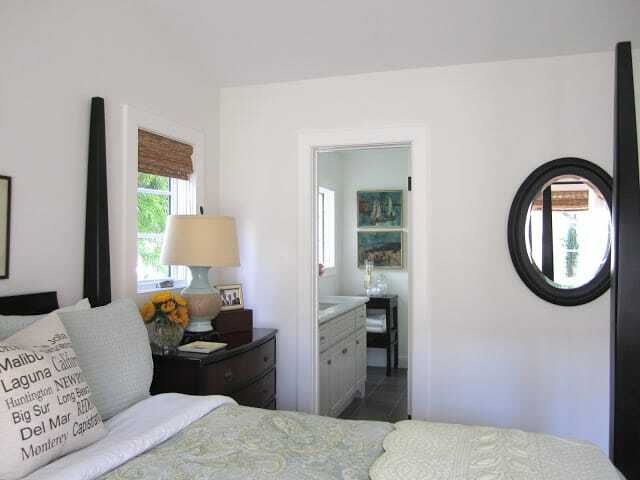 Gorgeous rooms and I love the bathroom mirror with the sconces! I am very much still enjoying messes from kid. Most of the time I don't bother cleaning up her room. It's always just a matter of seconds before the Barbie bomb explodes again! Lovely grown up boys room. My boys rooms (10 & 6) are much messier, but i embrace it. Their rooms look nice once a week at best. I have a nosy question for you. I am about to embark on a kitchen and bath remodel at my home on cape cod and was admiring all your cabinetry. I was wondering if it was custom. My guess is yes… Thank you. What a great room, you did a wonderful job on the remodel. It looks like a fabulous guest room! It's always nice when they are home, but it's such fun watching them fly! The room is beautiful…but yes, I imagine it might be more lovely to you with a couple of socks on the floor and the pillows mussed a little! What a beautifully designed space. It is bittersweet seeing them grow up but your son seems like an amazing young man. Tommy's a lucky son! And Kudos to Tommy on his endeavor's and accomplishments! What a stunning room to get to come home to. I have 3 sons and know what those messes are all about. I am still enjoying the messes. 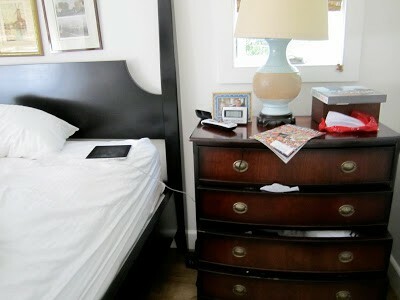 I have a similar bed to Tommy's in our guest room and my three boys all want to move into the guest room. I am firmly saying "NOWAY!!!". What a huge difference on the bedroom before and after! You did a wonderful job, the room looks beautiful and very well put together. The bathroom looks fabulous too! Tommy is such a lucky young man to have a wonderful mom like you! Hi Mary Ann~ I love your son's room. What a great job you did. It is so tastefully done as is the bath. Perfect for a young man. He is a long way from home and so is your daughter. When my daughter was studying in London the distance was so apparent every single day. I guess I did get use to it. Not easy though. With such a fantastic before/after for Tommy's room I'm sure your get requests to do others. Best of Luck to Tommy, and this will make life even more creative for your when he visits. You just never know how children are impacted by creativity except, when they are involved, it leaves a lasting impression on them. The room is beautiful! I would love to know where you purchased the window shades. The bit about the Martha Stewart prank made me smile. What a great sense of humor! You rock! 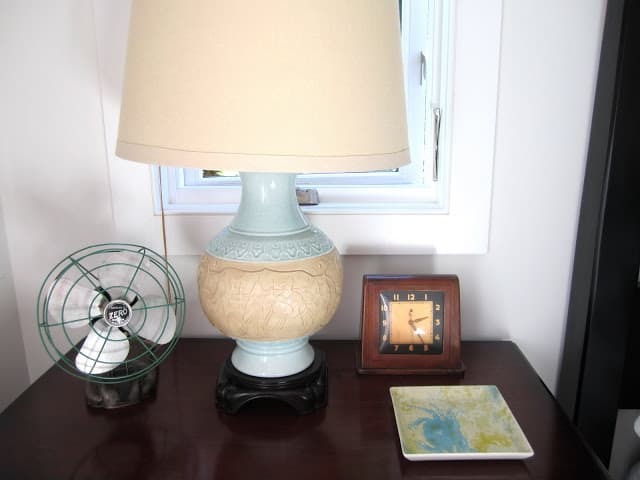 How handsome this room turned out! My kids are all still at home and little. Sometimes, I wish that they were gone, for about a week. Then they can home! 🙂 One amazing room transformation! The things that drove me the craziest about my kids were the things I missed the most when they left – loud music, slamming doors, empty milk cartons put back in the frig, etc. Love his room and bathroom…of course I love seeing the before shots too. Always so much fun. I'm totally embracing the mess of my 12 year old boy…this last move made me realize how quickly they grow up and leave. If we had not moved I don't think I would have stopped long enough to consider that. My daughter is 16 and neat as a pin…which I kinda love, but I'll take my sons mess and try to relax, knowing the next 6 years will fly by. I just love everything you do! This room is so wonderful. Cathy H.
That is a stunning transformation!!! I love Tommy's room. My oldest is 13 and I'm already starting to feel the transition to being a couple again. Love his cheeky humour. what a beautiful room you created for your son! i love that you have included some before pictures—especially of the bathroom. it really shows the amount of work you have out into this space!! i also LOVE the photo of the way the bath "normally" looks. we all need to be reminded that even a beautiful, magazine-worthy house looks "normal" sometimes. Mary Ann, You did a wonderful job decorating Tommy's room. We have been empty nesters for a while now. One of the best things about our kids growing up is that now we have five grandchildren! truly outstanding! Tommy is lucky to have you! I love how you can look into the bathroom now, and the sink isn't the main focus, like the before picture! Super cute!! Congratulations to your son and all of her achievements! 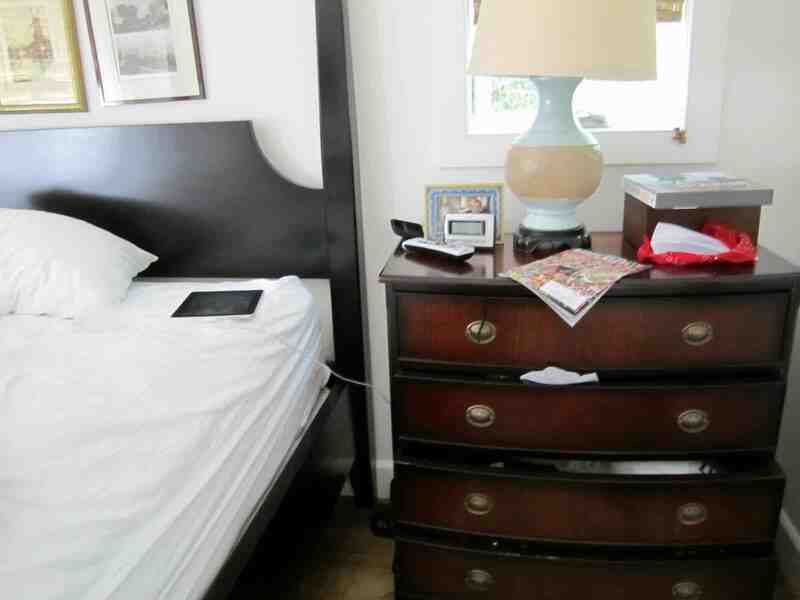 The bedroom is so beautiful – can I say that about a guy's room? 🙂 The bed is a piece of artwork and everything looks so relaxing a calm. Just what a bedroom should be. You did a wonderful job redoing his room. Everything is so soothing. Dropping by from Met Monday. Love what you did with his room. Tough question…. hmmm. The youngest of my 4 "little darlings" was the messiest of all the kids. and guess what? he has been out of the house for a year now, only to ask can he move home? I have redone everything!!!! all my beautiful work! WHaaaaa!!. I don NOT miss his messes! I was really getting used to this empty nest thing.. oh well . I love my kids. You did a great job! As I was looking at your pictures I noticed the bamboo roman shades. I have been trying to decide on some for my house. I would love to where you got yours. Mary Ann, Tommy's room is a dream! My son's room never stayed nice and tidy, either! All it took was for him to throw all his football junk on the floor to mess it up completely! The room is in a state of flux since he left- I'm not sure what direction I'm going with it. 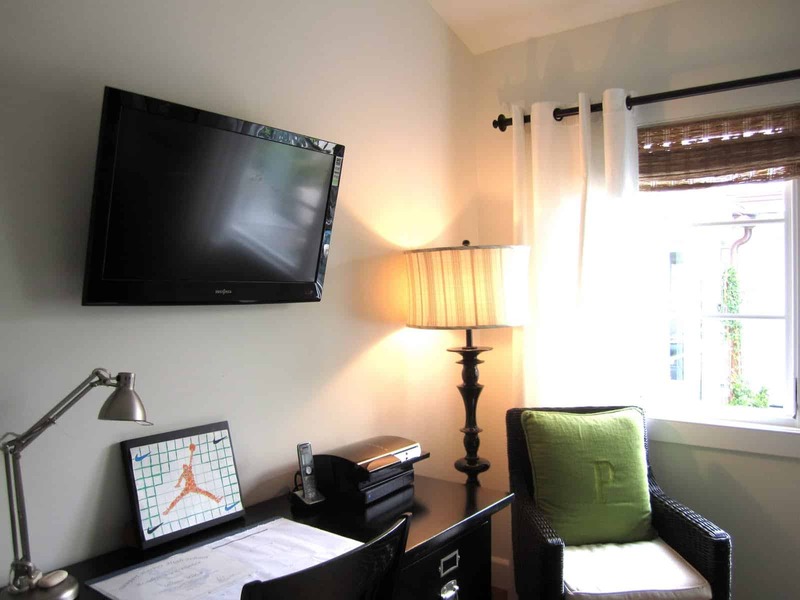 But it will be a guestroom and not his room, anymore. Our kids grow up, leave, and come back to visit occasionally. And we are left to keep the memories. I used to go in and just smell his pillow when he left for college! He must miss his room. its great! Our oldest tweo sons are gone – but the 'baby" is still home – he is 19 and goes to a college an hour away so he commutes. He leaves his clothes on the floor- his dishes in his room- honestly , I don't mind. He will be gone soon too. Magazine worthy I love the white walls with the dark furniture and neutral touches! I'm surprised he would ever want to leave that room! 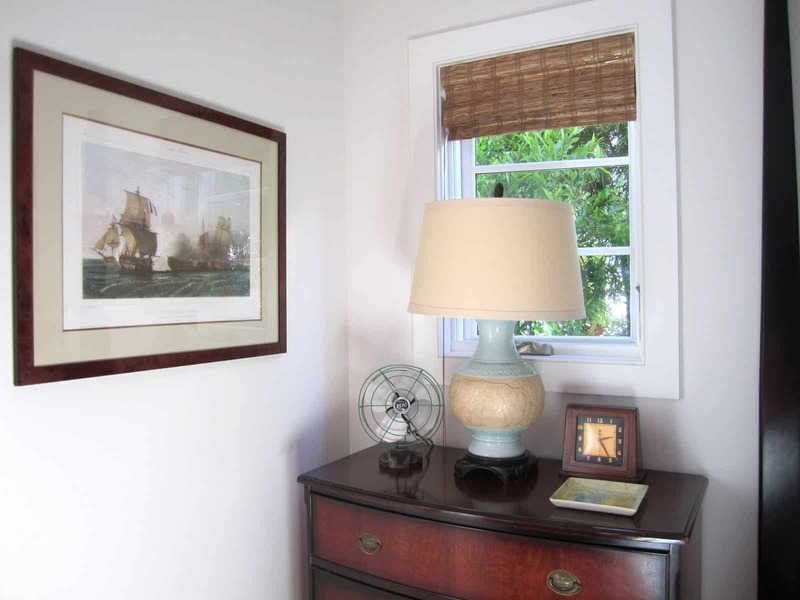 Tommy's room is stunning…timeless and classic with great accessories. 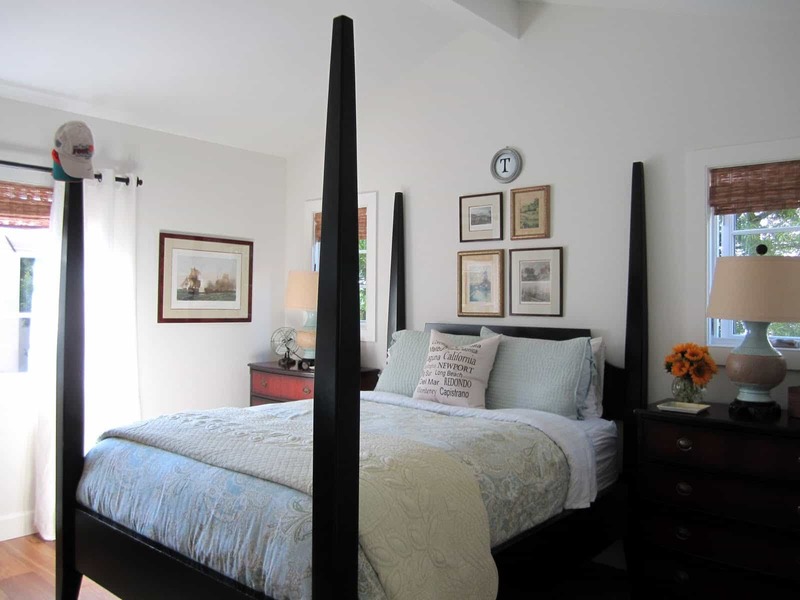 I love the dark wood and neutral walls and your choice of bed linens. Wow – his room and bathroom came out great. You are so talented. I love your home. I am going to send you an email. 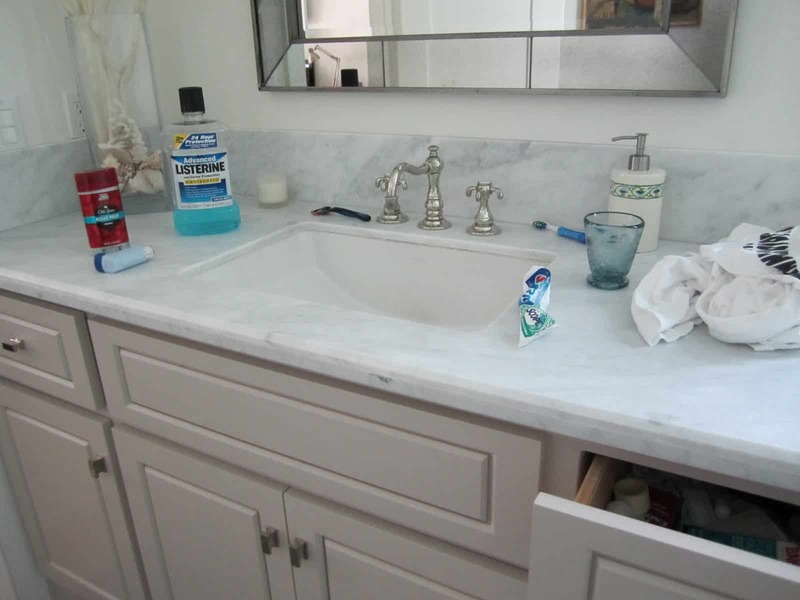 Have a question on your marble countertops in the kitchen. What a fabulous room and bathroom! 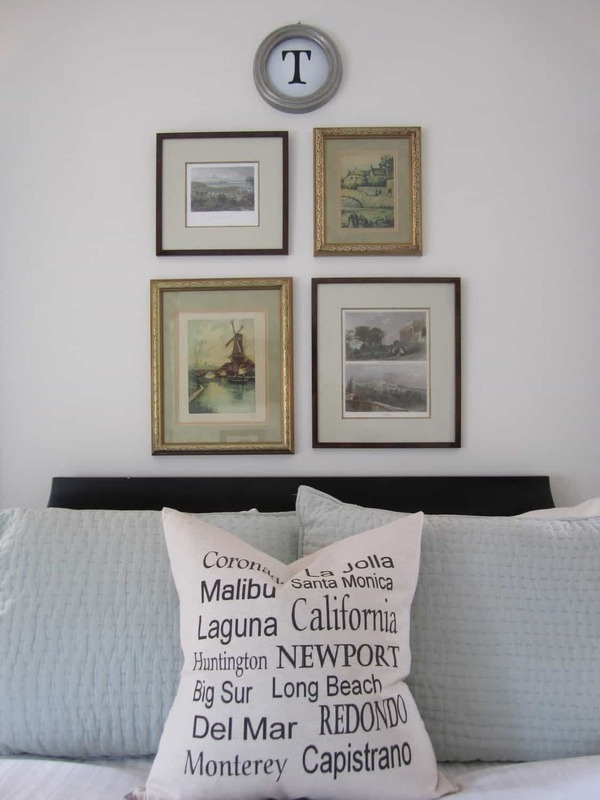 Love the styling of the pictures above the bed. Beautiful! What an amazing transformation of that green room. I'm so happy you featured some realistic everyday versions of the room too, or I'd probably hang from the cord of my vacuum cleaner at this point.. The moving of the windows really worked wonders, so much more airy and bedroom like. And about the MS comment prank.. AWESOME!! I'm moving in next week! What a fantastic room for a boy. It's not "too" anything, yet it still maintains a ton of style. How sweet that he chose that print from France. what a great room! you did a wonderful job with the transformation. Wow- so sophisticated- love it! 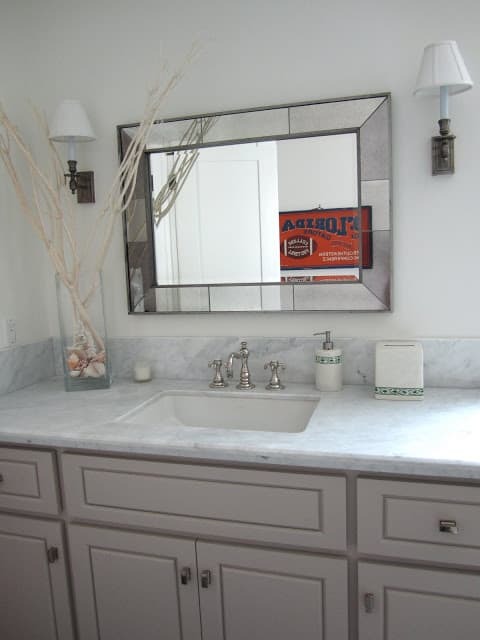 Great bathroom remodel as well, I love the classic look of subway tile. A really beautiful room! Every component goes together to create a wonderful place. aww… sweet son all grown up and beginning his life away from home. It is a hard transformation for mom and dad. Precious family photo that I'm sure you cherish! I have really enjoyed stopping by to visit with you! I am still enjoying(?) the "mess" – at least for 4 more weeks – but I don't think Tommy's room at its worst could compete with Matt's – I truly pity his soon to be roommate – LOL!!! I loved looking at all the pictures of your son's room. The vintage mix with the traditional…just gorgeous. Then I got to the end and it totally brought tears to my eyes…my oldest is leaving for college next month. So I will not complain about the messes made by my boys. I will enjoy this moment. Thank you for sharing your beautiful space and your heart! Such a wonderful room for a young man. Thanks for dropping by and sharing at Beach Cottage Good Life Wednesdays. You did a beautiful job! 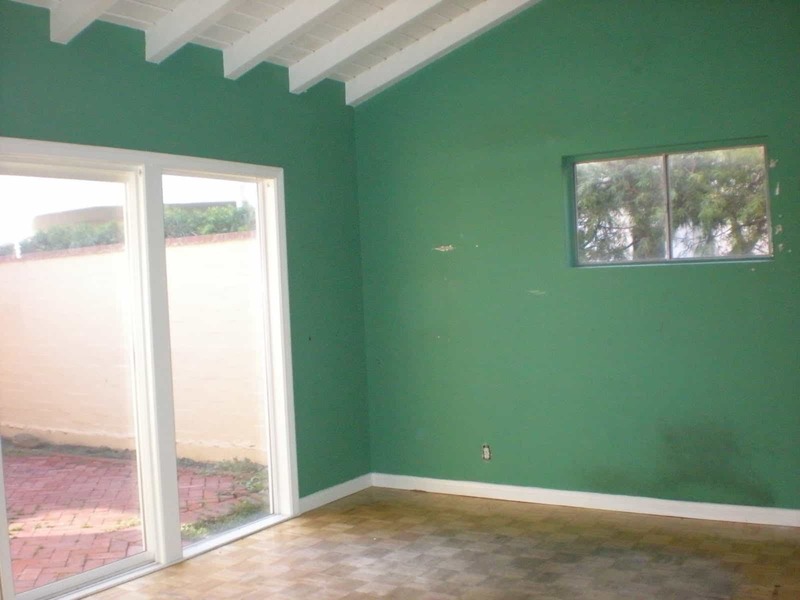 What paint color did you use on the walls? M: It is Benjamin Moore White Dove on the walls. Absolutely fabulous. Hope your son can deal with the Florida summer. He's going to be so happy to be home. It's a transition to not having our sons at home. Our youngest lives in Huntington Harbor- so we see him at major holidays. His older brother went into gas exploration- a real treat when he makes it back to California. What a lovely room! Love the artwork in his room and engraved monogram too! Beautiful Mary An, you did a great job. Love the charm of the room. Stunning! What a lucky boy to have a room as beautiful and timeless as that. Great job. That is an awesome room. I can see you are getting featured all over tonight…whoo hoo..congrats there girl! Found you at Savvy Southern Style. Your son's room and bathroom are so classically beautiful. You did an excellent job on the remodels. 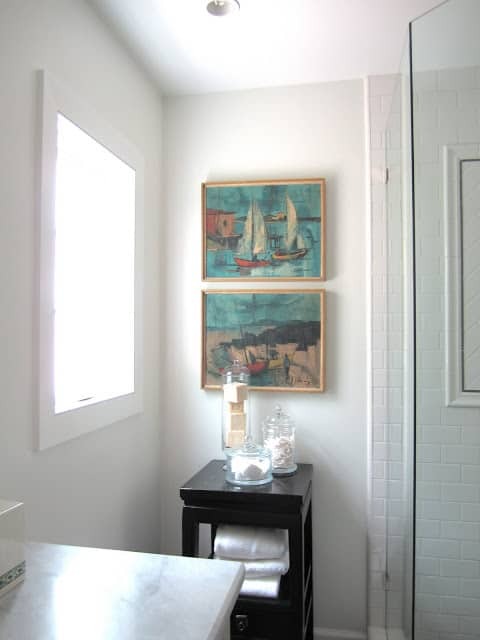 I especially love the pair of sailboat paintings in the bathroom. I'm going to include these projects in my weekly Metamorphosis Monday post later today! Looks great. That Martha Stewart comment cracked me up. Awesome. If it is OK please send back this link as I am contacting several gals. Hi! I'm hopping on over from Its So Very Cheri, and would like to know if you would possibly be able to share the paint color that you used for this room? Thank you in advance! This is a wonderful transformation! This room is truly impressive, Mary Ann. What a perfect room you've created for an 18 year old. Tommy is very lucky to have you. I'm sure he will have a great time in college (he's quite handsome and has a boyish charm – he should have no problem with the ladies!). Great work. A job well done on remodeling the interiors with the posh and polish furnishings. Kudos as well to the stunning photography. I am like design and paint of your bedroom to make it look attractive. Home decorating will only create additional space in your bedroom, Thanks.